When Chris Kirchner of C&G Air in Ocala, Florida, built his first airplane, he found his niche in life. His award-winning projects have been successively more complex, from a Kitfox to a BT-13, then a T-6 Texan, and now an amazing P-40N Warhawk. When he purchased a project as the basis for his next masterpiece, he found it carried with it the poignant story of the aviator who gave it its name: Bonnie Kaye. Today only two flying examples of the rugged, dependable, Vietnam-era C-123 Provider remain flying in the continental United States. The story of how the volunteers at Air Heritage Museum in Beaver Falls, Pennsylvania, were able to save their beloved THUNDER PIG from the Boneyard is priceless, and their use of the airplane on the airshow circuit and in movie appearances is a model of success. In 2015, Tim Savage appeared at the Arsenal of Democracy Flyover with his newly acquired A-26 Invader in a bold, authentic paint scheme. 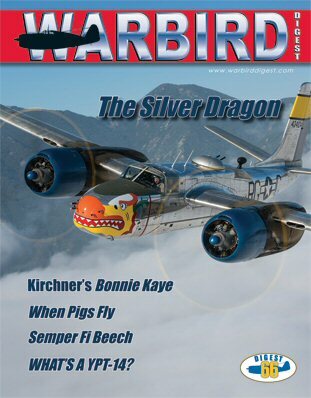 Building on the feature story we ran in Issue-27 (2009), Tim provides more details about the history of s/n 44-34104, and explains his plans for his rare, stock-military equipped Silver Dragon. John King Jr., the current president of the Flying Circus in Bealeton, Virginia, recently invited Stephen Chapis to visit the legendary Circus, where they put on an air show every weekend, flying wonderful, rare examples from aviation’s Golden Age. One of those aircraft, a beautiful WACO YPT-14, captured his attention and provided a learning experience that he shares with the readers of Warbird Digest. Nathan Harnagel is back with a great story about the prolific Beech-18 and from preflight to touchdown, he gives us a report on the beautiful example owned and operated by Scott Rozzell.